The choice is huge thanks to the huge competition between manufacturers. This makes the tuners available in many shapes, sizes, uses and at reasonable prices. Here are a few options to help you choose the best tuner for your needs. The pedal tuner is the most popular option among guitarists. A lot of us know what pleasure a huge pedalboard can bring. Metal suitcase, dozens of lights, various colors and effects… great picture. The styler is another reason to add a new pedal to the pedalboard. Apart from the visual effect, pedal tuners are also very effective. Let’s start with the most popular option for guitarists. The Boss Tu-3 is not accidentally at the top of the pedal tuners category. The options offered by this pedal are chromatic tuning, tuning guitars and bass guitars. One of the nicer features is the 7-string guitar tuning and 6-string bass guitar tuning option. This covers the needs of every guitar player out there. Compared to its competition, Boss Tu-3 is the fastest in tone detection. The pedal has a high brightness led display, which enables use even in bright light. As with all the tuners, the LED display has a red light and a yellow light. The green light is located in the middle of the display, which when lit means the wire is tuned. If the red light is lit on the left side that means that the tone is low and if it is on the right side – the tone is high. The box in which the pedal is located is almost indestructible, one of the main features of the boss pedal. The pedal functions both on battery and plugged in on the adapter. The only minus is the lack of an acoustic guitar tuning option without a pickup. This applies to all pedal tuners. The Behringer TU300 is a cheaper variant. It includes all the features that Boss Tu-3 has. The difference is in a somewhat weaker performance in the rapid detection of the correct tone and durability as well as the design, plus the brand itself. But the price makes this pedal an excellent choice. Although pedal tuners are a very popular and effective option, they are not intended for tuning acoustic guitars. 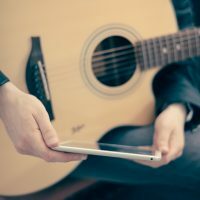 If you play acoustic guitar without a pickup option, the guitar tuning options are limited. If you use the same guitar in a quiet environment, the logical option is to use a tuner with a microphone. The tuning process is simple. The device receives frequencies through the microphone and through the LED display, as with pedal tuners, and it displays the pitch of the tone. Most of these tuners also have the option of working with an electric guitar using a cable. From these types of microphones, I will single out another Boss tuner. The BOSS TU88 tuner is amazing. In addition to the excellent accuracy of the microphone or cable tuning it also has a large LED display with a red and a green light which beeps when the guitar is in tune. What makes this device unique is that it also serves as a headphone amp. This way, in addition to using a cable with a Boss TU88 headset, it can be used at any time without disturbing your neighbors. You can also connect pedals or a guitar processor to the tuner that will take your playing to a new higher level. It can also be connected to an mp3 player for playing backing tracks or learning songs. In addition, the Boss TU88 also has a metronome. And let’s not forget, all this can be used with or without a headset. This model is very rare and if you manage to get it, you will make the right choice. And now let’s look at the cheaper option. The Yamaha YT100 is a tuner that I, personally, have been using for more than 15 years. Incredibly durable, compact and super precise. In the beginning, I used the microphone for tuning the classical guitar. Ideal for home use. It is very simple to use and with its size and compactness, it is an ideal replacement for pedals when you need it just for tuning. This tuner is intended for guitar and bass guitar. The only disadvantage, if you have to pick one, is the lack of chromatic tuning. 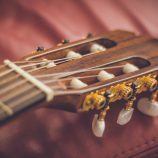 The third type of tuner that works for both acoustic and electric guitars are tuners that work based on the vibration of the actual guitar strings. This type of tuners is definitely the most compact. They are super small and easy to use. You just need to clip them on to the headstock of the guitar. No cables. Because they work by recognizing tone through vibrations from the guitar, it can also be used on acoustic guitars at home and on the stage. For electric guitars, you only need to reduce the volume and so no one will be able to hear you while you’re tuning. I will single out two models of the clip-on tuners to make it easier for you to chose the best one for you. The Korg sledgehammer pro tuner is among the best in this category. It has a unique design with a large display that is easy to read. Once set on the headstock of the guitar he turns on by switching the wheel on the left. And switching on the right changes the tuning mode for a guitar or a bass. The display has two colors, blue and green. When the blue light is on the left, it means that the tone is flat and when it is on the right, it means that the tone is sharp. In the middle, the green color means that the guitar is in tune. Detecting the tone is fast and accurate, which is to be expected for a tuner of this profile. D’addario stands out from the classic clip-on tuners with their shape and size. By keeping them small, they are more discreet, but despite their size, their display is quite easy to read. The D’Aaddario soundhold tuner is unique in that it does not attach to the guitar headstock but to the edge on the soundhole itself. This is quite useful when for any reason the clip on tuner cannot be attached to the headstock or you just do not want to have a tuner on the headstock itself. However, this limits its possibilities, this tuner can only be used on acoustic guitars. It is a chromatic tuner that can be used for non-standard tunings as well. It is very easy to use. There are two buttons on which the left is the power button and the right one is for tuning slightly of 440 Hz tunings. The tuner actually turns itself off after 10 minutes, which is a super feature. In this way, it saves the battery if you forget to turn it off yourself. The last option on this list is the cheapest, usually free, and it is the easiest option – using an android or an apple app. These tuners can be used only in a quiet environment because they only work through a microphone.